Quilting is my Down Time: Back to Canberra. Our coastal holiday had come to an end. 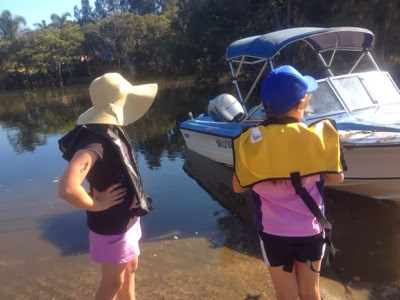 Yesterday Bridie, her friend Claudia, mum and I went out on Shoalhaven River for a quick ride in dad's boat. ( This boat was towed down the coast by me in mums tida.). 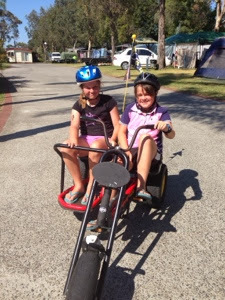 When we got back to the park Bridie and Claudia ride the double seated bike for an hour around the park. 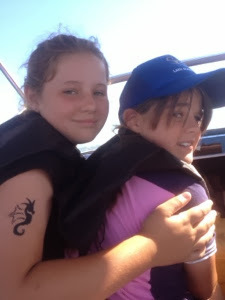 The girls shared the peddling. Mum and I went for a swim in the pool as it was sooo hot. We sat on the spa alcove and the kids kept turning the bubbles on for us which was delightful. This morning we drive home up over the Blue Mountains via Nerriga, Tarago and Bungendore, with only 1km of dirt I was more than happy. 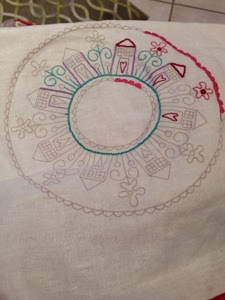 Tonight I have been stitching. I have finished the stitching for the scissor fob and the small bag. 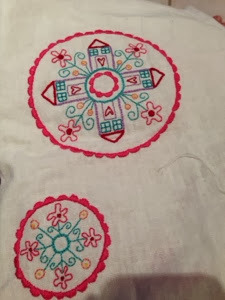 Tonight I worked on the pin cushion design which I started last night. Wow.....you are gamer than me ! I wouldn't tow a boat.